Revitalize winter skin with moisturizing exfoliants and body scrubs. Are you exfoliating on a regular basis? It's often a step we forget, but scrubbing off those dead skin cells is vital to maintaining bright, clear and healthy skin. Beautylish picks the Top 3 products to get you started. Not really sure what to expect during a body wrap? 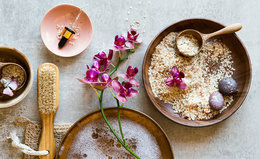 Beautylish's Victoria tests out the treatment to report on how a body wrap works and how to prepare for this invigorating spa treat. Learn how to create a delicious body scrub that will help slough off dead skin cells on your body, revealing baby soft and supple skin! After a long day of being in the brisk cold or sitting in room with its heater on full blast, your skin might be feeling extremely thirsty. Slough off your dry skin with these 3 easy DIY recipes with ingredients you can grab straight from your pantry!